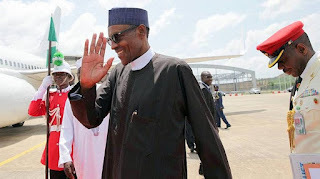 President Muhammadu Buhari on Wednesday night declared that the massive crowd that turned out to welcome him on his arrival in Kano for a two-day working visit was a message to the opposition that his support in the region remains unshaken and his popularity undiminished. President Buhari, who made this comment at a state dinner held in his honour, said he was grateful to the government and people of Kano for the very warm and peaceful reception. ‘‘I am overwhelmed with the massive reception I have received, and definitely, since this is partisan politics, I think it has sent a clear message to the opposition. ‘‘It has been so consistent and I don’t think I have the vocabulary to express my thanks to the people of Kano. I am very grateful to God and the people of Kano for the complete trust you have in me,’’ he said. The president, in a statement by his senior special assistant on media, Garba Shehu, noted that during his drive around the city on Wednesday to commission several projects, he observed that many of those who thronged the road to welcome him were very young people. He pledged that, as a person in a position of authority, his priority was to provide a meaningful future for the teeming youth in the country through education and the prudent management of the economic resources of the country. President Buhari restated that his message at his inaugural address, “I belong to everybody and I belong to nobody,’’ will continue to guide his stewardship to the Nigerian people. ‘‘My problem is Nigeria and I have been involved in almost all the instability Nigeria experienced: the civil war, the coups, and counter-coups. That was why I said during my swearing-in that ‘I belong to everybody and I belong to nobody. Stakeholders of the All Progressives Congress (APC) in Kano State yesterday adopted President Muhammadu Buhari as their candidate for the 2019 general election. According to a statement by the president’s senior special assistant on media, Garba Shehu, the party leaders also expressed their support to Governor Abdullahi Umar Ganduje as their sole candidate for 2019. LEADERSHIP Friday reports that President Buhari did not accept or decline the endorsement in his speech even after the party leaders promised to procure the nomination forms for him. The party leaders even threatened to sue if he declined the said endorsement. But President Buhari merely beamed with smiles and went on to underscore the need for unity in the party and among the diverse peoples of Nigeria. The APC stakeholders meeting, held on the sidelines of the president’s state visit to Kano, was attended by Governor Ganduje, his deputy, Professor Hafizu Abubakar, the state chairman and members of the state executive committee and members of the national executive committee of the party from Kano State. The state chairman of the APC, Alhaji Inuwa Abbas, hinged their endorsement of the president on his achievements in the last two years, especially in the fields of security, the war against corruption and the revival of the economy. “Security is important for everyone, not just for Borno, Yobe and Adamawa states; it’s even more so for us as a commercial and industrial state. We are convinced that you are best for these times when the country has begun to muster energy and resources to develop agriculture, infrastructure and empower the younger citizens,” Abbas said. Speaking on a jocular note, governor Ganduje said the party was prepared to drag the president to court to force him to accept the second term ticket. In his response, President Buhari said he understood the clamour by the ordinary people on the streets who raised four fingers on each arm, ‘’meaning four plus four,’’ that is, second tenure as president. He, however, stressed the need to sanitise party politics by ridding it of vote buying and violence. “What I saw in the elections in Kogi, Bayelsa and Rivers – the use of money and those headless bodies – really upset me. I don’t wish to see that anywhere. I would not have won if money and killing was the modus of operation. That is my view of politics,” the president said.